How Long It Takes For A Tattoo To Heal ? Stage-By-Stage Process! Getting a new tattoo can be an exciting process and you can’t wait to show it off to the world. But keep in mind, your skin has now been through some trauma and needs time to heal. That means that you need to protect the area as much as possible from the elements in order for your tattoo to look its best. There is always a healing process that every tattoo goes through. There are many stages of a healing tattoo that we will go through with you. You may thing that it’s no big deal but the way that you care for your tattoo while it heals will determine how it will look for years to come. We will show you what you can expect through the healing process so that you know what’s normal and what isn’t. We will show you what warning signs to look out for as well. Maybe you don’t realize that a tattoo is just like any other open wound. That means that it can become infected much in the same way as a cut. You need to protect the area from outside bacteria so that it can heal back to full health. Getting a tattoo is like damaging the skin. Thankfully it does regenerate back to original health but while it’s in a weakened state, it needs to be cared for. It won’t be exactly the way it once was because at this stage it now has thousands of ink particles inside of it but it can still come pretty close to in good health. Before we go into what your tattoo will look like while it heals, let touch on some aftercare instructions. Some of these will overlap in the healing process as well. If your tattoo artist tells you to do something with your tattoo, just do it. He is the expert and he’s doing his best to help to make sure that your tattoo does not become infected. Now, advice may vary from artist to artist but for the most part, it’s all the same. Some have different ideas, but no one is really wrong. There are many different ways to care for a tattoo. You may even be given a leaflet so that the tips are easy to remember. Most tattoo artists will tell you to keep the area covered for about 2-5 hours after the tattoo has been completed. 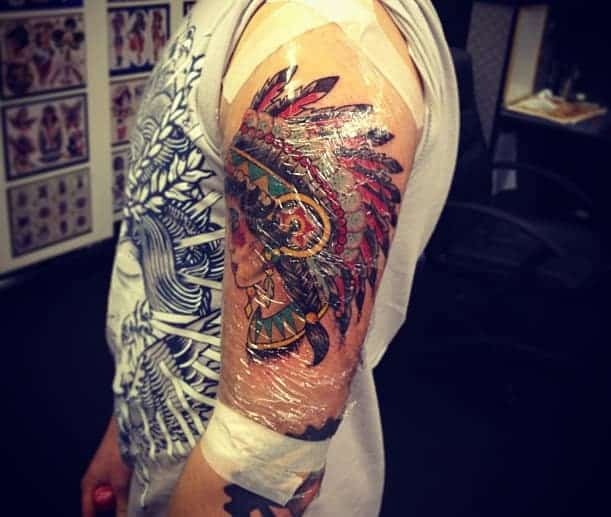 After that, you can carefully remove the bandage and very gently wash the tattoo. It’s going to be tender and sore so wash with lukewarm water and mild soap very gently. One thing you don’t want is to have your tattoo dry out at all. It’s important to moisturize your tattoo regularly with unscented moisturizer. Bepanthen is a really good moisturizer and it is often used for baby rashes. Your artist may even recommend a lotion to use. At this point, you can choose to put the bandage back on or leave it open to the air. The cleaning process should be repeated 3-5 times a day. It’s really important during the beginning of the healing process to keep your tattoo as dry as possible. That means no swimming for a while otherwise you can cause damage to your tattoo. You can still take a shower because cleanliness is important but baths are out of the question for now. You have to avoid soaking your tattoo in water for about a month at least. That is something you can discuss with your artist. If you are a sun worshipper, then you need to make sure your tattoo is covered. It’s is important to not expose your tattoo to sunlight while it’s healing. The skin is already damaged and doesn’t need to be further damaged, especially if you happened to get a sunburn. There is also the risk of fading the tattoo if it is exposed to too much sun. When the tattoo is completely healed make sure that you are putting on a high SPF to the skin to protect it. There are even some tattoo specific sunscreens available out there. We know you are anxious to show off your tattoo but there takes a lot of patience in order to make sure that your tattoo is ready to be shown to the world. You want the best for your look and sometimes that takes some patience. Healing is different for everyone. It’s going to depend on how well your skin heals, to begin with as well as the size of your tattoo. It could be just a week if it’s a simple but if it’s a complex and rather large tattoo, then it could even take a couple of months. It’s a good idea to continue to do the after-care instructions for as long as your artist tells you. He knows best and if you follow his advice, then you are sure to get the best results. You want it to be moisturized and clean for a good few months after that and don’t use any abrasive products. There are a lot of things going on during the healing process. At some point, you are going to experience scabbing or flaking of the tattoo. Unfortunately, this is a stage that your skin will go through where it’s really itchy. The last thing that you want to do is scratch the area or pick at it. The problem with picking at it is that you can cause the tattoo to fade or it could be removed altogether. Do not scratch the area at all. The best thing that you can do is to lightly slap the area instead of scratching it. Thankfully, this stage only lasts the first few weeks. It’ll be over before you know it. Tattoos can always be touched up if you need it. If you lose ink during the healing process, most artists will touch it up for free if you need it. You shouldn’t be losing ink at the beginning and studios don’t want to get a bad reputation so they will likely take care of you. They will want you to be happy with the finished product so that you can show off the tattoo and talk about it with your friends. Don’t go back for touchups until at least 6 weeks after the tattoo. They won’t touch up a tattoo that hasn’t fully healed yet. There are three processes that your tattoo will go through when it’s healing. This is the most tender part of the healing process and it begins the moment you get out of the chair. Ink has been injected into an open would so you are going to be sore for a while. You are going to experience redness of the skin and even a little oozing. It will get better each day and you will start to see some scabbing. This is when the itching is going to start now that the scabbing has happened. The scabbing will continue until the layers of dead skin have fallen off. Your tattoo may look fully healed at this point but there is going to be some cloudiness on your tattoo for a few weeks. It’s the deeper layers of skin that are still healing so don’t stop looking after your tattoo. If you notice during the healing process that your skin remains itchy, or is raised, hot to the touch, stays red or bleeds for more than a day after it’s completed, then you need to go see your tattoo artist immediately. Those are clear signs that your tattoo has become infected. You will be happy to know that an infected tattoo is a rare occurrence but it is still a possibility. If you are worried about anything at all, then get your tattoo checked out just to be safe. Believe it or not but there are simple things that you can do that can actually ruin a fresh tattoo. “To keep your tattoo looking as good as possible for as long as possible; stay hydrated, avoid sun exposure by applying sunscreen or wearing clothing that covers your tattoo, [apply moisturizing] lotion regularly, and [follow] proper tattoo care during healing,” Leo Palomino, a tattoo artist at Atomic Tattoos. Loofahs are super soft, right? So why can’t you use it on your tattoo? You don’t want to rub your tattoo with anything abrasive and believe it or not, a loofah is abrasive enough for you to avoid. The tattoo shouldn’t be rubbed at all and that includes with a cloth. Using soap in your hand is all you need to do. This is exactly the kind of thing that you wouldn’t think to worry about, but a towel is another thing that you should avoid using on your tattoo. But obviously rubbing a towel against your tattoo to dry it is not a good idea. “You should always gently pat the tattoo dry and allow [it] to be open to air afterwards,” Palomino says. Yes, you definitely want to make sure to lotion the area throughout the healing process but you want to avoid some ointment on the tattoo. It’s easy to think that this would e a great way to get it to heal quickly but it would be more harmful if you overdid it. It won’t make it heal faster, instead, it will suffocate the tattoo which could cause a growth in bacteria. The only time you should apply ointment is after it has been washed twice a day. You only do it until it starts to peel and then you can switch to lotion. You are going to experience some itching and it’s important for you to not scratch the tattoo. The tattoo needs to be able to scab and fall off on its own. Otherwise, you can cause damage to your tattoo. If it’s summer it can be tempting to go out in the sun and enjoy your time in the pool. It’s important that you avoid the pool for a period of time. If you expose your tattoo to too much water you can literally draw the ink from your skin which would alter the appearance of the tattoo and that’s the last thing that you would want. We can also mention that there are a lot of germs in pools despite the amount of chlorine that’s in the pool. There is no way around it, pools and Jacuzzis can be carrying chemicals, dirt and bacteria that can cause an infection in your tattoo. Stay away from the pool for at least 14 days. What’s the big deal with exercising? You can do most anything after you get a tattoo but just don’t hit the gym immediately. If you have a large tattoo in an area that you would end up rubbing at the gym, then it would be even worse. Your skin moves around a lot when you exercise and that can cause cracking n the skin. You don’t want any unnecessary irritation to occur with your tattoo. You don’t have to wait long before you hit the gym, just a couple of days. That way it’s not still fresh and oozing when you go to the gym. These are just some guidelines to follow when allowing your tattoo to heal. The best thing that you can do is to follow the instructions that your artist gives to you. You can’t go wrong with following the lead that your artist goes to. Tattoo Aftercare 101: Everything You Need To Know!